Nobody has a mouth exactly like yours, and our partial and full-set custom dentures are the ideal solution for your specific situation. At Dental Oasis of Clayton, we understand that having a nice smile and the ability to chew properly is important for your overall well-being and confidence. If you have missing teeth, that is something you want a solution for that fits your circumstance. Our custom dentures provide the restorative option that works best for you, whether that is as a partial or full set of dentures. We take the time to fully explain the process involved with getting custom dentures, any necessary dental work that needs to happen beforehand, and the related costs involved whether you have dental insurance or need information about our office membership plan as a self-pay patient. It is this high level of customer service and dedication to making our patients comfortable that led to us winning the “Neighborhood Favorite” award in Clayton, North Carolina. While you might find custom dentures at other dental offices in the area, you won’t find the spa-like environment with everything from Netflix and Pandora streaming to neck wraps and warm face cloths, all designed to ease your anxiety as you get your custom dentures. 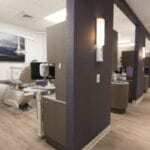 Our name says it all – we are an oasis in a desert of dental offices! If you have any questions about partial or full-set custom dentures or any of our dental services designed to give you the smile you deserve, don’t hesitate to contact us. We will be happy to schedule an appointment so you can be examined and put a plan into place. With early morning hours three days a week and later hours twice a week, we are confident we can accommodate your busy schedule.